Yoshi Yamamoto, the 35-year-old president of Yucho Shuzo sake brewery, is considered a hero by many sake connoisseurs, including other sake brewers, sake sommeliers, and sake drinkers. The sakes he has been making for the past 10 years under the Kaze no Mori (“Wind of the Woods”) brand are excitingly effervescent and enticingly bright, and are balanced by rich creamy finishes. Kaze no Mori expresses the full range of fruity and earthy fragrances and tastes of Nara's land, forest, and mountains. It is made from pure cold well water sourced from the base of Mt. Kongo, rice grown high in the mountains in fields edged by forests, and yeast harvested naturally from the air and water. But Yoshi is not recognized as an industry leader solely for making delicious premium sakes with flavor profiles that capture the region’s terroir. He is also admired for creating a new generation of diverse and versatile sakes that are bursting with flavor and character. As the 13th generation of a family of sake makers in a region that is the birthplace of sake and home to many of sake-making's most important developments over the centuries, Yoshi's skills, pioneering spirit, and passion for making sake are not surprising. Here he is explaining the sake-making history and traditions that have inspired Kaze no Mori sake. Nara prefecture is the birthplace of the Japanese state as well as of sake. The two went hand in hand. When Japan’s first emperor, Emperor Jimmu, brought his followers from the islands of the Seto Inland Sea to the wide fertile valley and protective mountain ranges of Nara prefecture 2,600 years ago and established the Yamato kingdom, the move inland was a fundamental turning point in Japan’s transition to a land- and grain-based society. Rice was the most important grain, and from the new state’s beginning, sake, a liquor fermented from rice, was made in clay pots in small batches first by the imperial court and then by monks at Buddhist temples for ceremonial and religious purposes. Sake means "sacred food", and this ancient sake—likely a fizzy, cloudy, slightly sour, and boldly flavored brew—was used as a ritual offering to the divine spirits and a way for humans to commune with the gods. It wasn't until the 16th century that sake started to be made on a large scale for popular consumption. Driven by the need to make money following the political and social upheavals of the Sengoku period (1467-1603), the Nara monks took advantage of a major new development in food making—the invention of large wooden barrels—to mass produce sake. The monks also introduced several other innovations to make and distribute sake on a large scale, including pasteurization, filtration, the milling of rice to remove its fat and protein layers and thereby increase its starch component, and the development of a method to cultivate a concentrated batch of yeast starter, which was called bodai-moto after the Bodaisen Shoryaku Temple where it was invented. Many of these innovations also had the benefit of improving the quality and consistency of sake, albeit at the expense of taming its flavor. Sake, not surprisingly, became a popular drink, and consumption was fueled by Japan's prosperity and the emergence of a new urban culture of pleasure and entertainment during the Edo period. To curtail the power of the Buddhist temples, the Tokugawa shogunate (1603-1868) transferred the right to make sake to the merchant class, and it was at this time that Yucho Shuzo was founded by Yoshi's 11th great-grandfather in 1719 at Gose, a merchant town located in the middle of Nara prefecture very near to sake’s historic origins. From the slopes of the Kongo-Katsuragi mountain range on the western edge of Nara prefecture you can see across to the sacred peaks of the Omine mountains in the east. Nara is one of Japan's few land-locked prefectures. Filled with waterfalls and rivers, the beautiful, rugged prefecture was an excellent place to locate a state and to produce sake. Clay pots like these were used for centuries to make sake in small batches. 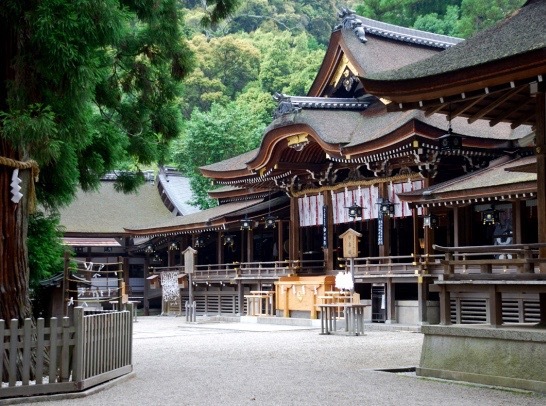 Located at the base of Mount Miwa where Emperor Jimmu and his followers settled in Nara prefecture, Omiwa Shrine is Japan's oldest Shinto shrine and also the patron shrine of sake brewers. Sake brewing remained basically the same for the next several hundred years until the 20th century when microbiology, technology, and modern equipment enabled major advances in the quality and complexity of sake. This new era of sake-making was once again anchored by a change in the vessels in which sake is made: the replacement of the odorous wooden barrels by stainless steel tanks. The steel tanks allowed sake brewers to make sake that better expressed the many subtle and nuanced fragrances and flavors that were possible due to the development of high quality rice hybrids, new yeast strains, and machines that enabled rice to be milled down to 60% of its original size for refined ginjo sakes and 50% and below for super-refined daiginjo sakes. By the end of the century, sake brewers were making sake the best it could be—a refreshing, silky smooth, clean-tasting liquor with the beautiful fragrances and delicately delicious tastes of rice, water, and yeast. Sake had truly become a drink for the gods. The original 1700s building at Yucho Shuzo sake brewery, well, and steel tanks reflect the key elements behind Kaze no Mori sake's success: Centuries of sake-brewing know-how, the best local ingredients, and modern technology. Yoshi is proud of the pristine and delicious spring water used for Kaze no Mori sake and makes it available to anyone in the community who wants to fill a container. Amidst the explosion of very fragrant, highly refined, and nuanced sake styles being brewed in recent years, Kaze no Mori sake stands out as distinct. It has a gentle aroma, rich slightly sweet fruity flavor, and a complex texture combining a zippy fizz with a creamy umami smoothness. It's both elegantly modern and robustly full-flavored. While Kaze no Mori sake is made using the best local ingredients and brewing traditions, it is more than a jizake, or regional style, sake. It is a sake based on Nara's deeper sake-making traditions: pure and natural, focused on expressing the flavors of the rice, innovative, and able to be enjoyed daily by anyone anywhere. The starting point for Kaze no Mori is bodai-moto yeast starter. Yucho Shuzo sponsored the revival of the 500-year-old bodai-moto method of making yeast starter at Shoryaku Temple, and early each January Yoshi joins the monks to cultivate it from scratch in time for the new sake-making season. The method is unique in that it captures naturally active lactic acid from the air and water, making the yeast an alembic of the region's flavors. Used in all of Yucho Shuzo's sakes, bodai-moto gives Kaze no Mori the refreshing juicy acidity and deep rich taste of umami that underpins the flavor profile of the series. Next comes the rice. Kaze no Mori sake is fundamentally about showcasing and celebrating the many flavors of rice. It is also with the rice that Yoshi's skill, sense, and passion are most evident. His craftsmanship is reflected in his choice of rice, mastery at expressing the rice's best qualities, and artistry at creating great individual sakes that come together as a complementary suite of flavor profiles. Kaze no Mori sake features a range of rice varieties, not just rice native to Nara prefecture but also strains of some of the best sake rice from elsewhere in Japan that are grown locally. The native Nara rice includes the mellow earthy Akitsu-ho, elegant sweet Kinuhikari, and the rare and complex-tasting hybrid Tsuyubakaze. Other rice used include the sweet earthy Hattan Nishiki rice from Hiroshima prefecture, rich earthy Omachi rice from Okayama prefecture, and soft fragrant Yamada Nishiki rice, a hybrid developed in Hyogo prefecture that is considered the king of sake-making rice. Most of the sakes use rice milled down only to the 80-60% range of their original size to leave a solid taste of the rice. This also leaves a good deal of creamy umami in the flavor and mouthfeel, which balances Kaze no Mori's natural acidity and brightness. Rice is milled finer than that for some rice to best showcase their special flavor characteristics. Naturally sweet and more elegant rice like Kinuhikari, Hattan Nishiki, and Yamada Nishiki are milled down to 50% or less to express the rice's fineness and fragrance. It is with the prized, creamy and earthy Akitsu-ho rice, an old eating rice of Nara prefecture whose cultivation was revived five years ago, that Yoshi demonstrates the terroir of Nara prefecture as well as his virtuosity. Akitsu-ho rice is featured in four different sakes milled down to varying degrees to showcase the rice's range of flavor, fragrance, and way it interacts with the other key ingredients of yeast and water. Kaze no Mori Alpha Type 2 sake is a particularly bravura performance. The Akitsu-ho rice is milled to an incredibly low 22%, bringing its flavor contribution down to a subtle par with the yeast and water. The overall taste of the sake is like drinking Nara's fresh mountain air and water. Another star turn is Kaze no Mori Junmai Akitsuho "Manaka" Shiboribana. This sake is made the same way as Kaze no Mori Junmai Akitsuho Shiboribana, with Akitsu-ho rice milled down to 65%. But "Manaka" contains only sake from the middle of the tank, not the full tank as with the regular Junmai Akitsu-ho. The pure, strong flavor of the "Manaka" sake explodes in the mouth. Kaze no Mori sake takes its name from an ancient location near the top of Mount Kongo, the highest peak in the Kongo-Katsuragi mountain range. 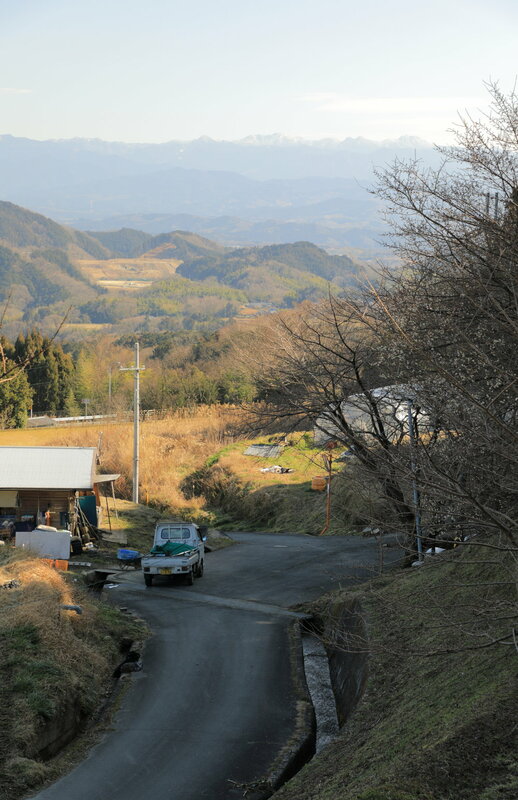 The stone marker indicates this location, which is now one of the farms situated high in the mountains amidst the forests that are supplying locally-grown rice to Yucho Shuzo. Rice grown in these paddy fields benefits from the cold pure mountain water and cool nights. The exceptionally cold water spilling down from Mount Kongo enriches the rice grown on the mountain's slopes with its purity, minerals, and mountain flavors. Percolating up as spring water at Yucho Shuzo's brewery in Gose, its purity enables Kaze no Mori to be brewed naturally and without pasteurization. To capture the fullest flavor, the sakes are all fermented for a long 30-32 days. To ensure the most natural flavor, all Kaze no Mori is junmai sake, meaning it's pure and not diluted with alcohol or water. In addition, Kaze no Mori sake is unfiltered and unpasteurized, which gives it its slight effervescence, as well as makes it a completely natural, fresh-tasting, and full-flavored sake. This revival of old-time fresh and natural flavor is made possible by modern technology and equipment. The stainless steel tanks keep the sake intensely cold. The customized pressing and bottle filling machines have been designed to preserve the sake's freshness and prevent the development of any unhelpful microbes. Kazuma Matsuzawa, standing on the right in the main fermentation room, is Yucho Shuzo's toji, or chief brewer. Like Yoshi, Kazuma is 35 years old and was trained by Yoshi's father, Chobei Yamamoto. The Kaze no Mori series of sake is a spectrum of flavor profiles for all kinds of occasions and types of foods. They all have a pleasant gassiness when opened and a refreshing acidity that is rounded out by a range of fruity and earthy full-body flavors. The balance of acidity and creamy umami in all Kaze no Mori sake means that it is very drinkable, being both tantalizing and satisfying at the same time. It also means that it can be paired with a wide range of foods, including light classical Japanese cuisine and Mediterranean-style cooking, spicy Asian, and rich Western dishes, as well as the hearty mountain cuisine of Nara prefecture, which features bitter mountain vegetables, pickled and salt-cured fish, wild duck and boar, and buckwheat soba noodles. While it is easy to drink one type of Kaze no Mori from the start to finish of a meal, the variations of light to rich, dry to sweet lend them to pairing with different courses. Being unpasteurized, all Kaze no Mori sake should be kept refrigerated. And be prepared for the sake to pop like champagne when opened due to its natural effervescence. The Alpha Type series are lighter refreshing sakes that are wonderful as an aperitif and paired with light appetizers and delicate foods like tuna tartare, carpaccio, sashimi, herb salads, tofu, and soft Italian cheeses. They all have a lower alcohol level of around 14-15% vs. the other sake's 17-18%. Made with Akitsu-ho rice milled down to 65%. A remarkably crisp yet full-bodied sake with a fruity fragrance and flavor. Made with Akitsu-ho rice milled down to 22%. Yucho Shuzo's most refined sake, it has the light refreshing fragrance and flavor of the local mountain air and water. Made with the sweet earthy Hattan Nishiki rice native to Hiroshima prefecture milled down to 50%. A refined clean and dry sake enhanced by a seductive floral aroma. Pasteurized for the export market. Made with Yamada Nishiki, "the king of rice," milled down to 45%. Not currently available. The next four Kaze no Mori junmai and premium ginjo and dai-ginjo sakes go well with a wide range of everyday foods: mixed salads, roasted vegetables, and pasta dishes; grilled fish, chicken, and pork; and comforting soups and stews, such as Japanese sukiyaki and nabe hot pots. Made with the elegantly sweet local Kinuhikari rice milled down to 45%. A refined well-balanced sake. It's dry with a touch of sweetness and a wonderful aroma of woodland stone fruit—plums, apricots, cherries. Made with Omachi rice, one of the oldest pure rice strains in Japan, milled down to 60% to create a light sweet sake. A wonderfully fresh, fruity, and rich sake with a touch of sweetness made from Akitsuho rice milled down to 65%. Made with Akitsu-ho rice milled down to 65% but using only the sake pressed from the middle of the tank. Incredibly strong and intense flavor that explodes in the mouth. The last two sakes are the richest and fullest. Milled only modestly, they showcase the distinctly different flavors of their rice and are loaded with umami. They are prefect accompaniments for rich and spicy foods, grilled duck and beef, and dishes made with heavy sauces. Made with the complex local Tsuyubakaze rice bred specially for sake milled down to 70%. A delicious dry, rich sake with an entrancing floral fragrance and refined taste. Made with Omachi rice milled down to the minimum 80% needed to make sake. One of Yoshi's favorites, this is a big, rich, and earthy sake. The main entrance to Yucho Shuzo sake brewery. Yucho Shuzo is not open for visits nor does it sell its sake on the premises. However, Gose is a delightful country town to spend time in. Located at the foot of Mt. Kongo in a rural part of Nara prefecture, the town was created at the start of the Edo period (1603-1868) when it was laid out in a grid pattern to be a commercial and food manufacturing center for the area. Back then it was a leading maker of rapeseed oil, sake, and traditional kampo medicines, and the streets are lined with a fascinating collection of Edo, Meiji, and Showa era architecture built by the town's successful merchants. 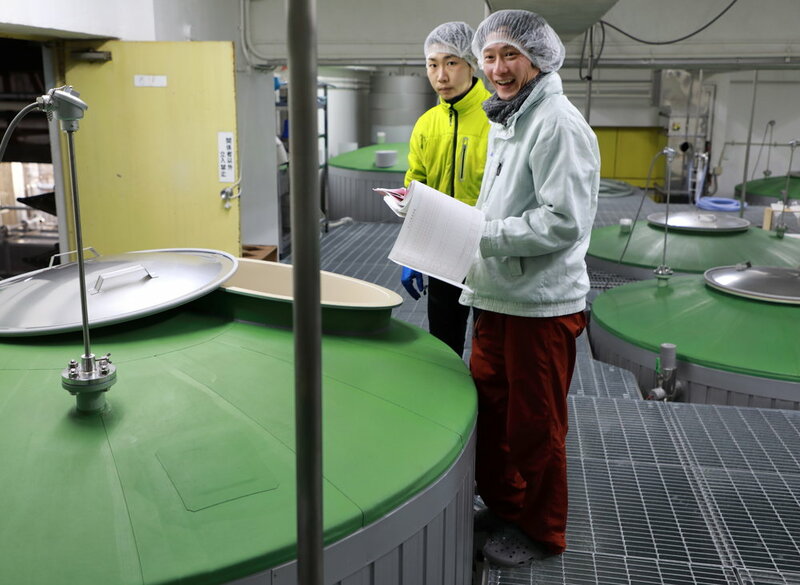 Gose continues to be a vibrant community and the home of a number of artisanal food makers, including Katakami Soy Sauce, a leading maker of premium soy sauce in Nara prefecture. Gose can be reached by either the Kintetsu Gose train line or the Japan Rail Wakayama line. 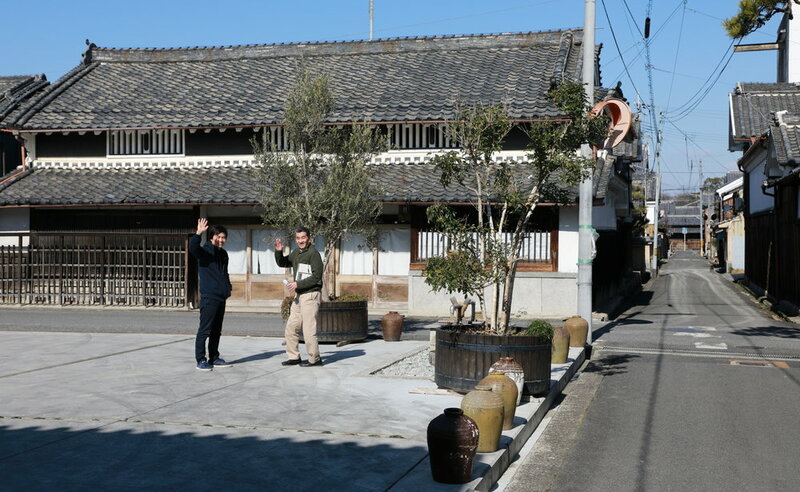 Many of Gose's buildings exhibit the handsome combination of black tiled roofs and stuccoed walls, white trim, and wooden doors and lattice that are characteristic of old merchant architecture in Nara prefecture. Katakami Soy Sauce makes one, two, and three-year aged soy sauce in traditional wooden barrels. The Katakami family offers regular soy sauce making demonstrations and workshops. A young architect who is helping to renovate and update many of Gose's old structures lives in this unusual house. Its gable end faces the street front and is positioned over a central door. All other old buildings in Gose have their gables perpendicular to the street front and their entrances on the right hand side. The main distributor for Yucho Shuzo's sake is Higashikawa Sake Ten, a liquor store in Gose owned by the town's mayor and managed by his wife. They are happy to ship orders in cold-packs by overnight delivery to anywhere in Japan. Gose is an active, friendly community, and Higashikawa Sake Ten is a busy hub for neighbors stopping by as well as for shoppers. Wadaya carries a full line of Kaze no Mori sakes as well as a selection of other interesting new generation sakes from around Japan. Kaze no Mori sakes are also available at most restaurants and shops in Nara prefecture and at selective sake bars, restaurants, and liquor stores in major cities in Japan and overseas. Kaze no Mori series of sake at Wadaya. Kashihara Jingu - A monumental Shinto shrine and garden complex built in 1889 on the site where it is believed that Japan's first emperor, Emperor Jimmu, ascended to the throne in 660 BC. Ishibutai Kofun - The largest megalithic tomb structure in Japan dating from around 626 AD. Hasedera Temple - A spectacular series of buildings and open staircases cascading down a hill. The main hall was built in 686 AD and is a registered National Treasure. Okadera Temple - Another large Buddhist temple complex founded in the 7th century housing many sculptural treasures including Japan's largest clay Buddha. Muroji Temple - Built in the 9th century, Muroji is an enchanting, rustic complex located deep in the mountains near the town of Uda. Gose is located about halfway between two of Nara prefecture's more interesting towns, Kashihara, a modest-sized city, and Gojo, a country town. The Imai-cho historic district of Kashihara and the town of Gojo are both listed as Significant Cultural Streetscapes by Japan’s Agency of Cultural Affairs. Each town has the accommodations and restaurants to make it a good base from which to explore the area. Uda, where Muroji Temple is located, is also a Significant Cultural Streetscape, and is another old merchant town to explore. The Kintetsu Railway connects Nara City with Kashihara, Gose, and Gojo and also provides service to stations near most of Nara prefecture's main attractions. The Takagamo Shrine was built by the ancient and powerful Kamo clan who also sponsored the Kamogamo and Shimogamo Shrines in Kyoto. It is located across the pond from Oi Soba, a delightful country restaurant. The tomb of Soga no Umako, a powerful clan leader who died in 626 AD, Ishibutai Kofun is the largest megalithic structure in Japan. Located in a 250-year-old traditional machiya house in Gojo, Genbei is a restaurant that specializes in local vegetables and vegetarian cuisine. Sui-an, a restaurant in the Imai-cho historic district of Kashihara, serves several new generation Nara sakes alongside a variety of seasonal dishes and soba noodles.